Saganaki (Greek σαγανάκι, literally "little frying-pan") refers to various dishes prepared in Greek cuisine, and is named after the single-serving frying-pan it is cooked in. One popular example is an appetizer of pan-seared cheese. 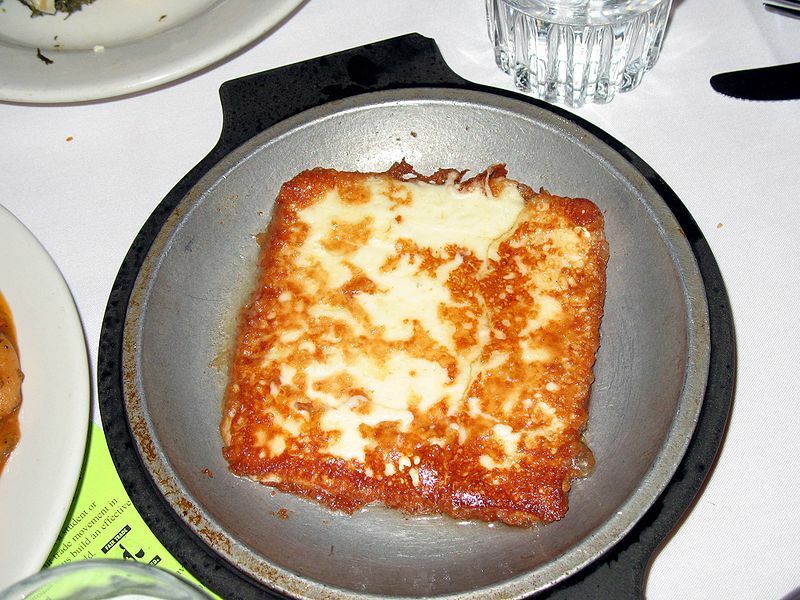 The cheese used in saganaki cheese is usually kefalograviera, kasseri, kefalotyri, or sheep's milk feta cheese. Regional variations include the use of formaella cheese in Arachova and halloumi cheese in Cyprus. The cheese is melted in a small frying-pan until it is bubbling, and generally served with lemon juice and pepper. It is eaten with bread. Other dishes that are traditionally cooked in the pan include shrimp saganaki (Greek γαρίδες σαγανάκι), and mussels saganaki (Greek μύδια σαγανάκι), which are typically feta-based and include a spicy tomato sauce. In many United States, Canadian and Australian restaurants, after being fried, the saganaki cheese is flambéed at the table and the flames then extinguished with a squeeze of fresh lemon juice.